Update your makeup routine by trashing these makeup habits that could be aging you. It’s true, we are creatures of habit, but sometimes our regular routine needs to be refreshed and renewed. This is especially true when it comes to makeup. Over time, tried-and-true techniques become dated or out of vogue. Here then are five makeup habits you might still be following that could be aging you. The year is no longer 1973 and this should no longer be your staple eye look. To highlight the brow bone, opt for a matte eyeshadow or a concealer in a colour slightly lighter than your skin tone. The origins of this technique is often traced back to the theatre world and the desired result was not to mimic the glowing flush of youth, but in fact to make the actor appear older. Yes, older. 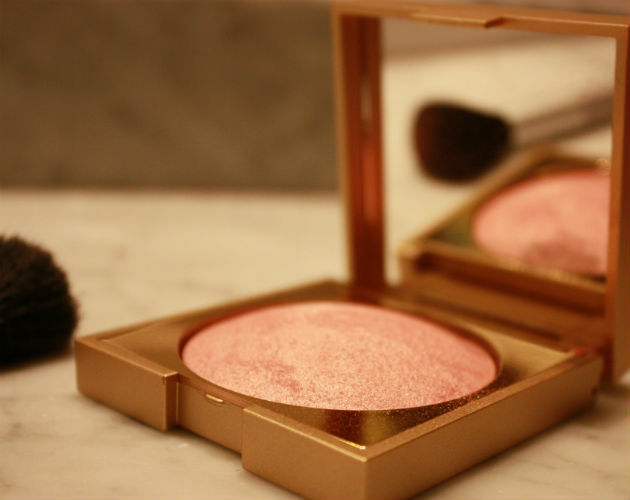 Try applying blush slightly higher along your cheekbones to visually lift the face. Excessive powder will not only give you a mask-like appearance, it will also settle into fine lines. Once you’ve applied your powder, dust off the excess with a fan brush or a clean, fluffy blush brush. Or opt for a translucent powder that is almost colourless but will still set your foundation or concealer. Many women overdo this trick and end up looking comical. To make your lips look fuller, apply lipstick as normal (choose a lighter colour as darker colours will make your lips look thinner), then top with a shiny lip gloss, and apply a touch of shimmer to the centre of the lips. You can also try one of the lip plumping glosses on the market (they do work, if only temporarily). A fuller brow is not only de rigueur it can also soften the face (super thin brows can make you look harsh). If you’ve gone overboard, you can try a brow and lash growing serum that will fatten them back up in a few weeks. In the interim, fake it by filling in with a brow pencil or eyeshadow.